Anna who is Magic: Persuasion. It is no secret that I love Jane Austen. I love her, and I love all of her novels. Most people would probably name Pride and Prejudice as their favorite of the Austens. However, I'm not able to do that. The best I've been able to do thus far is put the books in an upper three (Pride and Prejudice, Persuasion, and Emma) and a lower three (Mansfield Park, Sense and Sensibility, and Northanger Abbey), which is not to say that I dislike any of them. The other day, however, I was forced to pick up only one Austen, and, to my surprise, I just said it -- Persuasion. You see, Persuasion is the novel that features Jane's oldest heroine. At the ripe old age of 27 (pretty much a spinster in Jane's time), Anne Elliot had given up on love and was destined to live her life alone. Jane Austen herself never found love and also never married (often mutually exclusive in her time). Indeed, Anne Elliot was the Austen heroine most like Austen herself. Anne and Jane were both spinsters who watched people around them settle down, marry, and have children. The truth is, I think I've always seen a little of myself in Anne Elliot. I would love to be the witty, confident Elizabeth Bennet or the self-assured, playful Emma, but the truth is I am probably most like the introverted, mature Anne. This past Friday, my dear friend Maggie took engagement photos for Joe and me. Her specialty is photos taken outdoors in natural light, and her photographs are beautiful. (I am so fortunate she is taking my wedding photos as well.) Maggie took some photos in Ritter Park, but then, because she is such a good-hearted friend, also indulged my desire to have photos taken at the Cabell County Public Library, even though that is not something she usually does. Maggie, knowing that my love for Jane Austen is real and eternal, told me to pick an Austen novel for the photos. Just one. 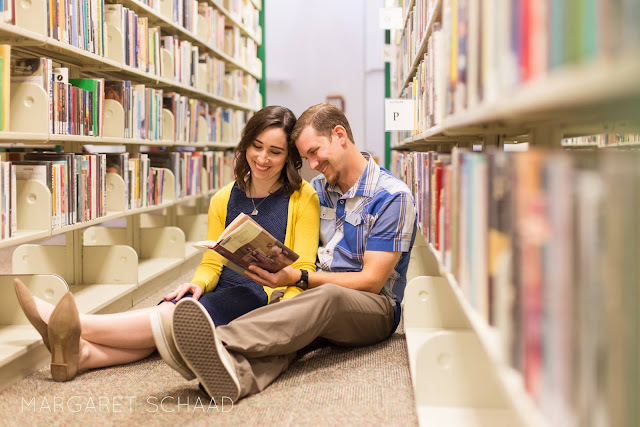 We used it in several photos, but my favorite was one where Joe and I were sitting in an aisle, surrounded by books, with him holding Persuasion and both of us looking at it. Although I am smiling in the photo, this was the moment during our photo shoot where there were tears welling up in my eyes, and they were real and big. You see, as I sat there in the stacks, beside Joe whom I love, who will be my husband for life, and looked down at the copy of Persuasion he was holding, I was overcome. Overcome thinking about Anne, about Jane. Anne, who got her love in the form of Captain Wentworth in the end, and Jane, who wrote the world's greatest love stories but never found love herself. Anne and Jane, who have gotten me through so many times in my life. 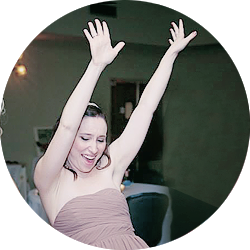 Times when I thought, like Anne did through most of Persuasion, that love wasn't in the cards for me, and I was destined to be the favorite aunt instead. Sitting beside Joe, who was holding Jane's story about Anne while I looked down into it, hit my heart in such a way that I still struggle to describe it, days later. My heart was so full that it came out of my eyes, I think. Incidentally, Maggie gave us one sneak peek photo in advance of the others we are to expect in about a month. She got it to us Friday night, the same evening she took the photos. Which one did she choose to send? Thank you, Anne. And thank you, Jane, as always.